So, this was one of my childhood ponies, and apparently at some point I gave her a haircut. Her symbol is a little worn as well. I intend to sell her at some point, but I'm not sure if I should try selling her as is or if I should get her restored first. How much would she go for at her current condition? How much would restoring her cost, and how much would that affect her total value? I would fix her up. She goes for $900+- I’m good condition. To order new hair would cost you about $20 (rerouting tools included). Rapunzel in this (hair) condition has gone for significantly less money. I wasn’t able to find any in less than A1 condition but if my memory serves me correct, I saw one with a major cut sell for like $50-80. So it is a big loss to you. But then, if I were you I would keep her after rerouting. She’ll look so beautiful again. Hmm, I see. How much would it cost to have a professional restoration? 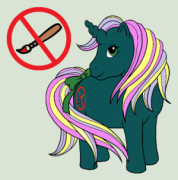 I may do it myself, but I would need practice on other ponies first. Even then I may still be too nervous to do it myself. Heh, I might end up keeping her after all that trouble. She may become even more valuable down the road, after all. I doubt they'll re-release her like some of the other classic ponies, and even then she'll still be an original Rapunzel. I guess I'll see how I'm feeling by that point. I would like to know where I can find someone to restore her, and how much it would cost. I just don't trust myself with the job. Still looking for someone who can restore ponies. If you purchase the hair/tinsel and ship he to me I am more than happy to reroot her for you. Her mane and tail would require two hanks each of Golden Delcious and Heartthrob from dollyhair.com. Then I believe the best match for her tinsel would be either Rose or Fuschia from sulky.com. Yeah, I could do that . How many spools of the tinsel would I need? Would you be able to touch up her symbol too? Or would that be someone else's job? Honestly I’m not 100% sure on the tinsel as I’ve never done that personally myself yet with new tinsel (I’ve usually used salvaged stuff from other ponies). I would get two just in case. I also just realized that you would only need 1 of the Heartthrob colour from Dollhair (I have a bit of extra here if I need it). But for sure would need 2 of the Golden Delcious colour for sure. Yes!! I can totally touch up the symbols too. I have all I need here to do that. Okay, I just ordered the supplies, so now it's a matter of waiting. Just an update on this beautiful little ponies on-going makeover. @Winged Mirage sent her beloved pony to me to fix up for her and I revived her last night. I got right to work, gave her a hair trim and removed her tail and (sadly) rusty washer then a nice Oxi bath and left her to dry over night. Today I got to re-rooting. She now has fresh new gorgeous long locks of hair and tinsel again. Then I got to work on touching up her symbols. Unfortunately I am having a heck of a time colour matching the pink of the tower. I may end up going to see if I can get it colour matched at a local artist supply store if I can’t find an actual “pink” acrylic to match. Funny how I thought it was going to be the yellow to give me a hard time. I will keep updating the process here as I move along the next few days. If anyone is interested. It’s so weird seeing other people’s pictures of my pony lol. She’s looking great so far! And yeah, paint matching can be a pain. Ahahaha! I bet!! So far it’s been a very therapeutic restoration for me. Never used tinsel before and it’s much sleazier to work with than I ever imagined. It's looking really great! One day I hope to learn how to do re-rooting. You should totally start re-rooting! It’s so much easier than it seems. Once you figure out what’s comfortable for you in regards to holding hair/pony it’s great and can be relaxing after a long work day. You hafta remember that since she has a haircut she'll go for significantly less regardless. Some people are very picky about a pony that'll cost them well into the hundreds. So if you decide to sell her, remember to add that she's had work done in the description. Skybreeze looks to be doing a lovely job bringing your girl back to her former glory. Bet your all giddy to have her done up. Skybreeze, that looks lovely!! I hope the paint matching goes well. Yeah I know. She won’t be entirely original, so that automatically decreases her value some. But she’ll still be worth way more than if I just left her as is. Here she is all done! She’s in her box and will soon be on her way back home. Im going to miss this little lady. We’ve bonded over the last couple weeks. Lol!! I really appreciate all you’ve done. It’s great seeing my childhood pony restored to full glory. I can’t wait to see her when she gets home.